It would be great to plan ahead and put together a Halloween costume in September or even early October. But like many people, sometimes you wait till the last minute. We get it. You need a costume fast, and you want to look cool, current, and maybe even a bit edgy. If you would like to be Post Malone for a night or award winner Lady Gaga for the weekend. 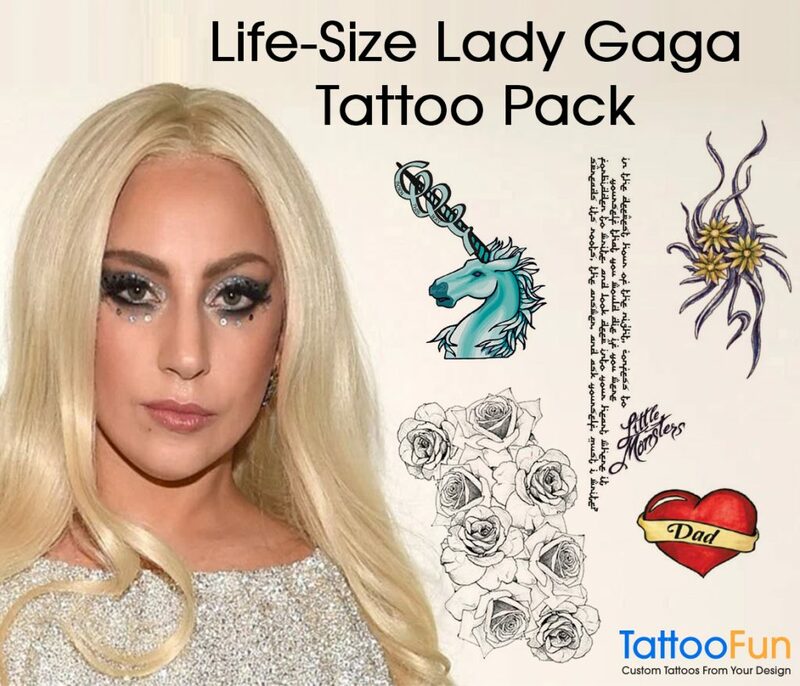 Celebrity Halloween temporary tattoos are an easy way that may even fool your close friends. 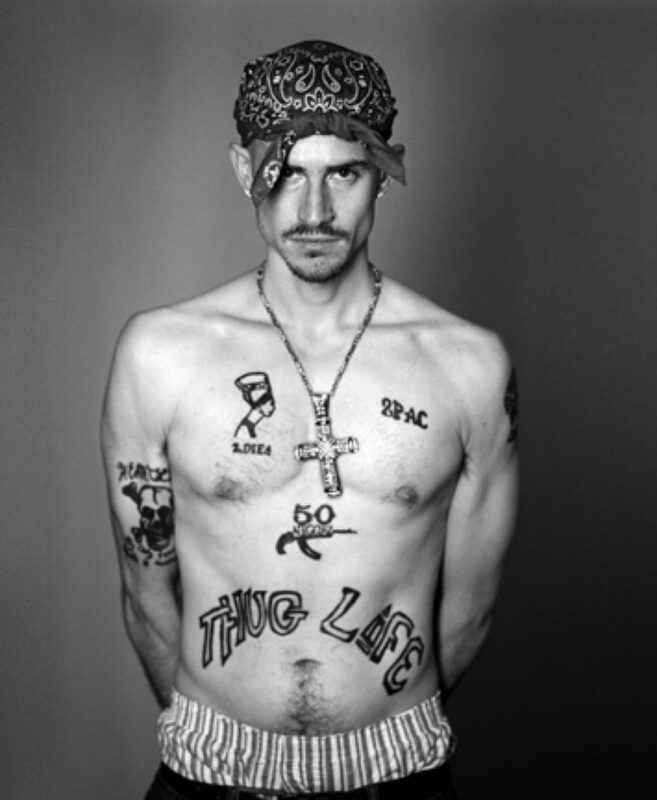 Temporary Tattoos Make for a Quick and Cool Celebrity Halloween Costume. One of the best benefits of temporary tattoos is that they look real, never smear and can be easily removed when you want. Today's printing technology, and skin safe inks, truly look just exactly like a real tattoo. Once applied, and dried for 20 minutes, they are now part of you. Even if you sweat you head off dancing at a crowded bar on Halloween night, or find yourself going for a late night Halloween swim. Celebrity Halloween temporary tattoos never smear and always look perfect. Post Malone, Tekashi 69, or Lil Peep. Be a Top Rapper for a Night. For less than $30 bucks, and 20 minutes of preparation time, you can be a chart-topping rapper. Post Malone's singles "Rockstar" and "Psycho": both have peaked at number one on the Billboard Hot 100 in 2018. 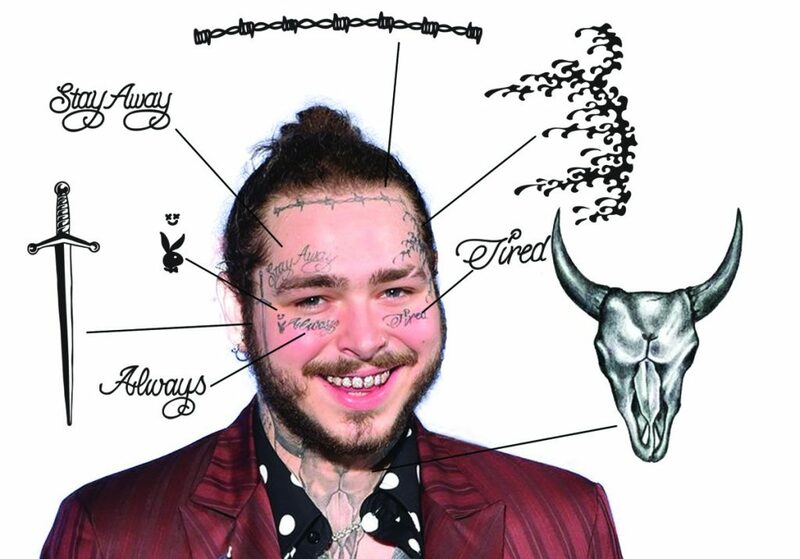 Being super popular and well-known, everyone knows his famous face tattoos, such as "Always Tired", "Stay Away" and of course the Bull Skull that covers his neck. Sporting these on your face makes instant recognition and temporary tattoos look so real while wearing them, you may even get the VIP treatment at the clubs. Not everyone is ready to be the infamous Tekashi 6ix9ine for a night. But if you can pull off the attitude, you'll need lots of temporary tattoos to seal the deal. 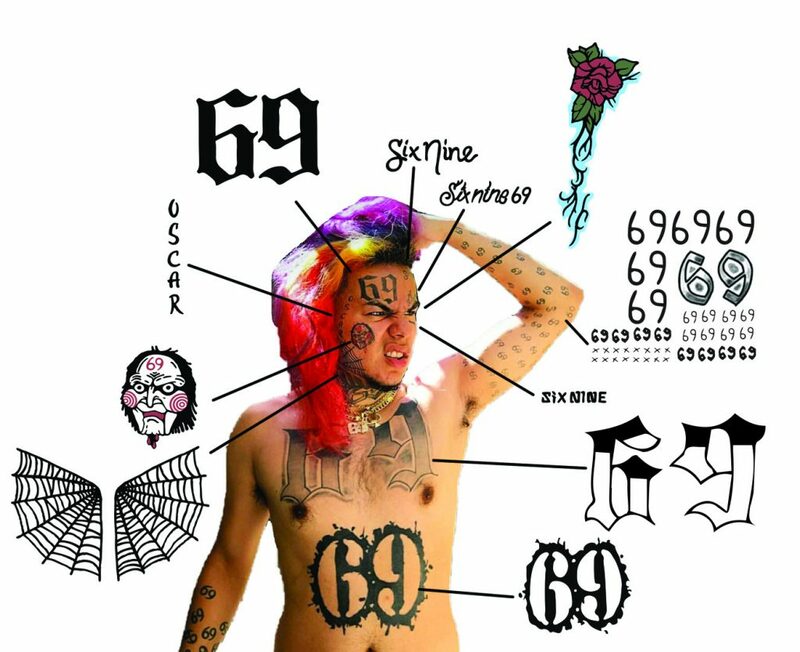 Think if the attention you will command while wearing a "69" and a Saw Clown on your face. Spray some temporary rainbow color in your hair and you will be all set for a night of adventure. (Remember: Tekashi69 Arrested on Racketeering, Firearms Charges, so be ready for actions). If you're into scary movies, and you want to be really creepy for Halloween, the red swirl cheek tattoos are what you need. 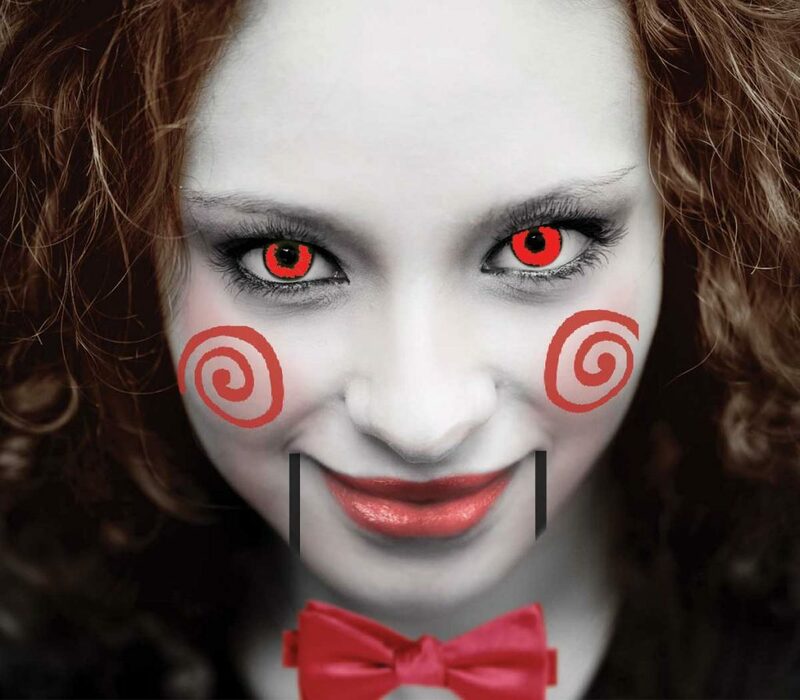 If you add red-eye crazy lense contact lenses, and a red bow tie, your creepy Saw Clown costume will be complete. Pop Stars, Movie Heroes, and Football Players. For a more feminine Pop Star look, get your self a set of temporary tattoos for artists such as Miley Cirus or Angelina Jolie. 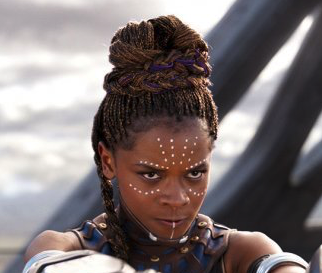 If you are a female DC movie fan, you may remember Shuri, the princess of the fictional kingdom of Wakanda, from the Black Panther movie. Applying a few face temporary tattoos and you will be transformed into the ebony Princess. Other Celebrity Halloween temporary tattoos available are newsworthy football players, and other DC Comic classics characters, such as Harley Quinn. temporary tattoos, going out wearing her tattoos will make you both a singer and actress. (A two for one). 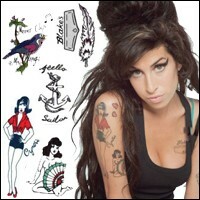 Our Personal Favorite is Amy Winehouse. Amy Winehouse was our first celebrity who was made into a Halloween costume. Amy's unique tattoos that filled both her arms have become timeless classics. Because of her various tattoos and crazy half-up-half-down hairstyle, she has become an important part of Halloween Celebrity dress-up. Although she is now a part of the #27club, she is remembered each Halloween by individuals who dress up as her for one jazzy night. 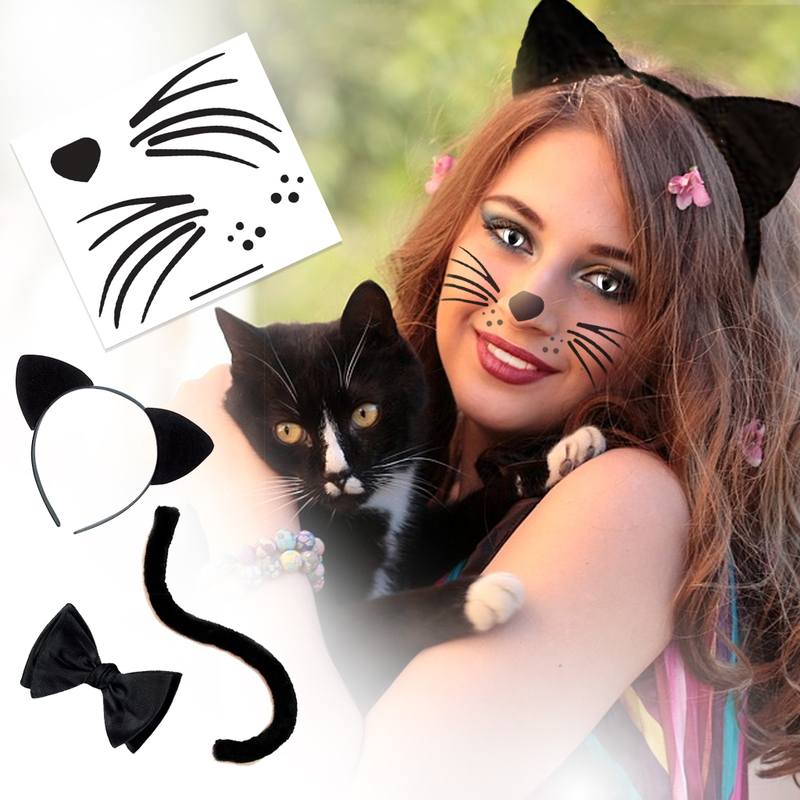 If you want to be a black cat (a Halloween staple) we offer ears, whiskers, cat eye contacts, and a tail. You can also dress up as a zombie, a werewolf, or a vampire. Harley Quinn is usually a great costume, as well. We sell several of her tattoos and her wig. All of these celebrity Halloween temporary tattoos are easy to apply to your own face with a little water. Simply put the tattoo against your skin and add water. The best part of temporary tattoos is that they stay on for days, but can be removed anytime with rubbing alcohol or even hand sanitizer. (They is also specially formulated temporary tattoo remover available). With over 20 years in the Temporary Tattoo industry, we know what people like. We ship millions of temporary tattoo sheets each month and they are all proudly made in the USA. All of our temporary tattoos are made with skin safe, FDA approved ingredients. We offer the best quality tattoos, every day low prices, excellent customer service, and your satisfaction is guaranteed!